The new Barr & Stroud ‘Series 4’ range of sports binoculars are a blend of superb optical quality, advanced mechanical design and contemporary styling that has produced an exciting range of binoculars that Barr & Stroud are justly proud of. 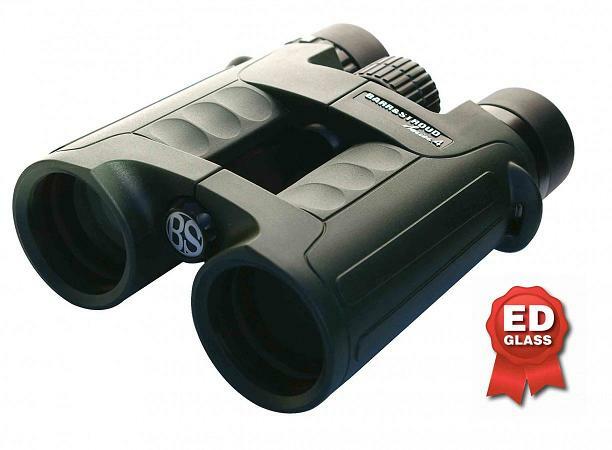 The use of ED, short for ‘Extra Low Dispersion’, glass in the manufacture of the binoculars high precision lenses, ensure that these binoculars are virtually chromatic aberration free, rendering superbly sharp, high contrast images in high fidelity colour. The ‘Open Bridge’ design of the Series 4 binoculars has a number of advantages over the more traditional designs currently available. The most obvious is the ease of handling that this design allows; ergonomically it is a perfect fit with the human hand. This makes it easy and comfortable to use in the most gruelling circumstances and particularly with gloved hands. A less obvious advantage, but one that will please many users, is the amount of weight that is saved by the ‘Open Bridge’ design, this makes the Series 4 particularly suitable to those who are constrained by the amount of weight they are carrying, hikers, walkers, holidaymakers or service personnel are but a few of those who will appreciate the ease of handling and comparative lightness of the Series 4. The ‘Series 4’ range from Barr & Stroud feature rugged construction combined with brilliant optics and high resolution eyepieces to produces stunning images. They are waterproof to a depth 1.5m of water for three minutes, plenty of time to retrieve them if you have dropped them in a stream or puddle. The binoculars are rubber armoured which protects them from shocks and knocks. The binoculars are filled with nitrogen gas which keeps water out and also stops the optics suffering from internal fogging in adverse weather conditions, this binocular is truly weatherproof. Fully Multi Coated optics are standard features of the Barr & Stroud ‘Series 4’ range as are BaK-4 phase coated prisms. This degree of sophistication ensures that as much light as possible is transmitted through the optics which results in super bright contrast rich images of high colour fidelity for the user even in low light conditions where less expensive optics and coatings result in a dramatic loss of performance. For the comfort of the user the binoculars are supplied with metal twist up eyecups that are rubber coated which make them equally practical for people to use with or without spectacles. The rapid focus mechanism takes the user from close focus to infinity in less than one turn of the focus control knob, which ensures that you can follow the action however fast it is happening. The ‘Series 4’ 8x42 is supplied with carrying case, rain guards, tethered lens caps, deluxe strap and lens cleaning cloth.